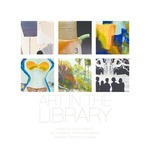 The Thomas G. Carpenter Library’s Art in the Library project began in 2008. Since the project’s inception the collection has grown to more than 100 pieces through the generosity of artists and collectors. Many of the works are by artists from northeast Florida. This is a selection of the pieces that may be found on display throughout the library’s four floors.